De-boned turkey, whole dried egg, peas, pea flour, potatoes, potato flour, natural flavour, flaxseed, apples, canola oil (preserved with mixed tocopherols), de-boned salmon, de-boned duck, coconut oil (preserved with mixed tocopherols), calcium carbonate, dicalcium phosphate, tomato, alfalfa, carrots, pumpkin, sweet potatoes, squash, bananas, blueberries, cranberries, blackberries, pomegranate, papayas, lentils, broccoli, dried chicory root, sodium tripolyphosphate, sodium chloride, potassium chloride, choline chloride, vitamins (vitamin A supplement, vitamin D3 supplement, vitamin E supplement, inositol, niacin, L-ascorbyl-2-polyphosphate (a source of vitamin C), d-calcium pantothenate, thiamine mononitrate, beta-carotene, riboflavin, pyridoxine hydrochloride, folic acid, biotin, vitamin B12 supplement), minerals (zinc methionine complex, zinc proteinate, iron proteinate, copper proteinate, zinc oxide, manganese proteinate, copper sulphate, ferrous sulphate, calcium iodate, manganous oxide, selenium yeast), taurine, DL-methionine, L-lysine, dried Lactobacillus acidophilus fermentation product, dried Enterococcus faecium fermentation product, parsley, peppermint, green tea extract, L-carnitine, dried rosemary. Calorie Content: ME (calculated)= 3741 kcal/kg or 430 kcal/cup. Excellent dog food. 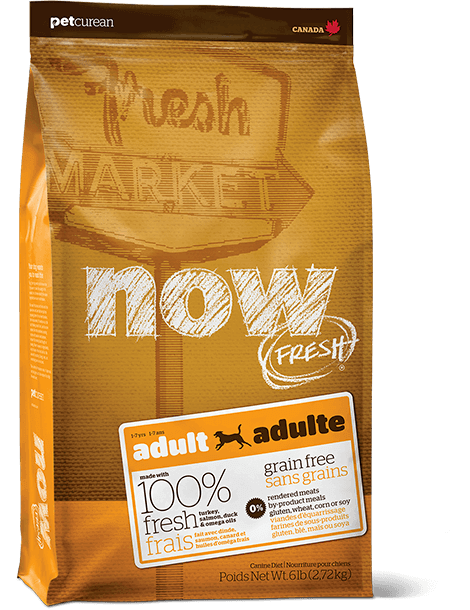 This is by far the best dog food I have ever gotten for my dog and I've tried quite a few brands! I really like how fresh it smells and that it is meal free. I love the ingredient panel and wouldn't change a thing. 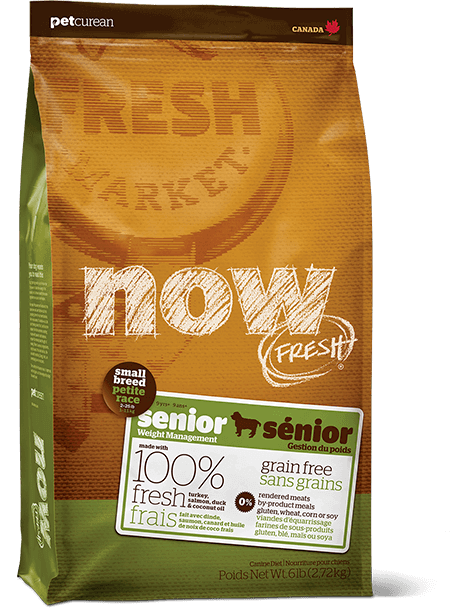 Grain free is important to me and I love that the Now line features grain free options. I also think it's nice that they have a small breed option. 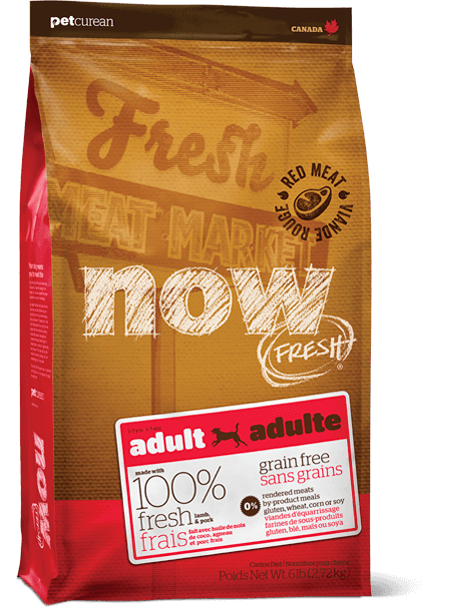 (smaller kibble size) Also this food is made in Canada, which is super awesome! I mix this 50/50 with a frozen fresh food called My Perfect Pet. I do wish they had a 3 pound bag since I'm not feeding it as her full diet, it lasts me 3 months. 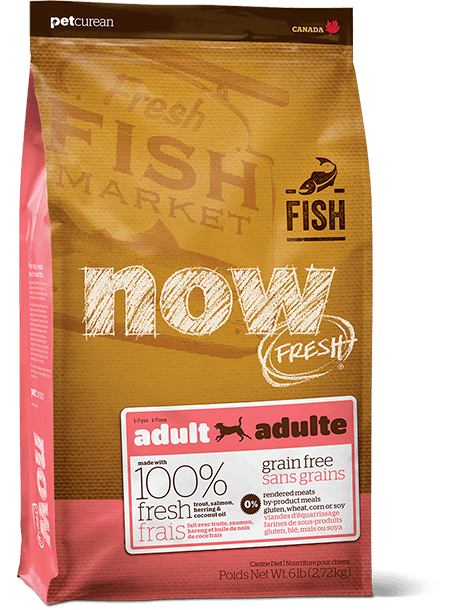 Someone at my local pet food store suggested this and I had never heard of it but thought I would try it, and I'm really glad I did! My Shih Tzu Pom X loves his Now dog food. 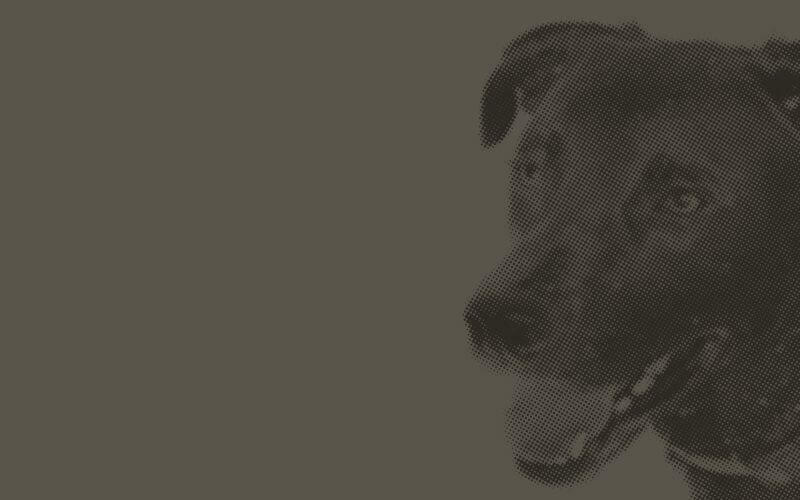 He's been on it since he was a year old, when he was taken off his puppy food the vet had prescribed. The small size of the dog crumbles are perfect for his mouth. All his chewing teeth are in the back of his mouth because of his underbite and harder or larger dog foods are not something he can chew. The healthy ingredients have kept him at a good weight. He loves the taste and will not eat other dog's food. My little dog will be on Now until the vet says he needs a different food. Best food we've ever tried! My little yorkie/pom loves this food like crazy. He's been on it for years now and still gets excited for every bowl he eats. I love the ingredients and I feel really good about feeding it to him. I couldn't ask for a better food for my little guy! My dog Lily absolutely loves this food. She is a diabetic long-haired dachshund, so her nutrition was important to her health. We struggled to get Lilys blood glucose under control, thus creating other secondary issues and infections. We were recommended several 'vet formula' foods but were disappointed with the ingredients. We had heard of another person who had great success regulating their dog with a grain-free diet and suggested Now- Fresh. I was immediately excited to try this food once I read the ingredient list. Good quality local proteins, and a diverse selection of fruits and vegetables made it an easy sell. We have had Lily on the small breed formula for months and we are happy to report that Lily's blood glucose has been at an acceptable level and we haven't had any infections. 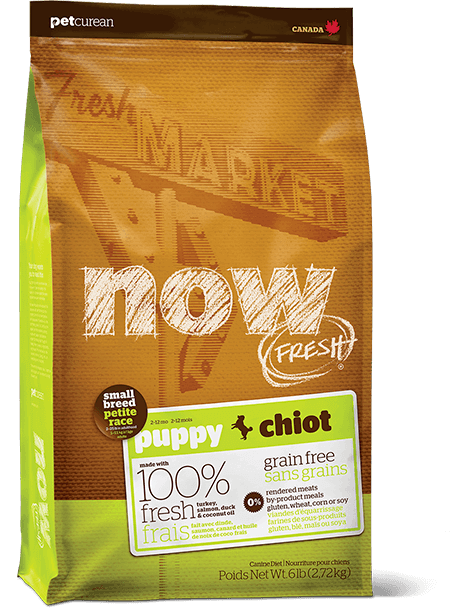 I'm so grateful for the results we've achieved with this food, I would almost eat this kibble myself!